What Do We Feed Our Gliders? 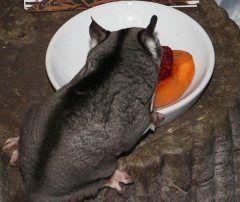 Most experienced long time sugar glider breeders and owners recommend using a "proven diet" to keep your gliders healthy and fit. This means a diet that has been used successfully over time to provide balanced nutrition along with appropriate vitamins and minerals. There are a number of proven diets and we use The Pet Glider Fresh Diet developed by Priscilla Price. The majority of ingredients for this diet can be purchased in your local supermarket, prepared in batches and frozen in cubes for an easy to serve, balanced meal each night. We also recommend The Pet Glider Complete Multi-vitamins with Calcium be sprinkled on their meal each night, as directed on the package. The calcium-phosphorus ratio is very important to keep your gliders bones healthy and strong. We also recommend providing filtered or bottled water for your gliders because tap water is often high in phosphorus, causing calcium absorbtion problems. In addition to their primary meal, a cereal or monkey biscuit is often recommended. We like the brown rice and chicken cereal available from The Pet Glider, or at least our gliders do! They enjoy a crunchy midday snack and it can help to keep their teeth & gums in good shape. Healthy treats like mealworms and small yogurt chips are fine in moderation too. Remember pits/seeds and skins can be toxic!